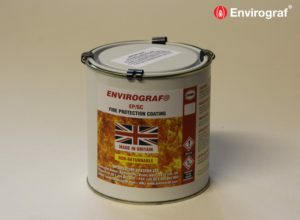 A coating system designed to upgrade new and existing UPVC window frames and doors, offering up to 30 minutes fire protection meeting both UK National and European Fire Regulations. Designed for both internal and external use and can be coloured to RAL colours if required. required. For spraying, add up to 10% warm water but ensure the correct amount of material is applied. Apply two coats of UP30WB at 6m² per litre per coat. Can be applied using brush, roller or spray. WB top coat must be applied once the UP30WB has dried. at 10 – 12m² per litre per coat. coat at 10 – 12m² per litre per coat. 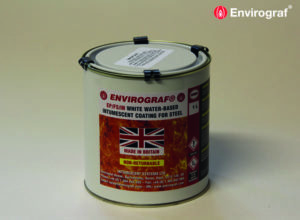 Intumescent paint and varnishes for wood etc.